I recently had the pleasure of attending two workshops at this years UX Camp put on by UX Edmonton. UX Edmonton works to bring together designers, developers, researchers and analysts from all industries that share an interest in user-centered design. Each year, UX Edmonton hosts UX Camp which includes speakers, panelists, and this year for the first time, a day of workshops! The two workshops I attended were: Improving UX through customer journey mapping, presented by Kristel Tan and Carissa Ng of Top Draw Inc., and Look what you made me doodle: using visualizations for problem solving and communication, presented by Benjamin Franck of Jobber. I had a ton of fun and plenty of “A-HA!” moments, some of which I thought I’d share with you below! 1. Never underestimate the importance of the planning phase. We’re all busy people. It can be tempting to just jump into a new project feet first, because you want to get started as quickly as possible. However, if you don’t take the time to sit back, think and research before beginning, you’re probably going to end up chasing your tail or being held up by things you hadn’t considered. This idea seems simple in theory, but it’s hard in practice. We might think, “I’ve done stuff like this before – I’ll just get started”, or “This is just a small project, I don’t need to layout a detailed plan”. Too bad that every project is different and no project is never actually “small.” Both workshops I attended were both very focused on things that happen pre-launch. By getting everything laid out and organized beforehand, you (and everyone else attached to the project) are then working from one unified roadmap. Everyone knows what happens when, and what to expect. Work smarter, not harder. Take time to plan and layout your project, no matter how big or small, and you’ll be on your way to efficiency. 2. Mind maps & flowcharts rule. Do you remember mind maps? I don’t know about you, but somewhere between elementary school and today I stopped using them. WHY DID I STOP USING THEM?! Benjamin Franck’s talk on visual literacy reminded me about how useful they are. 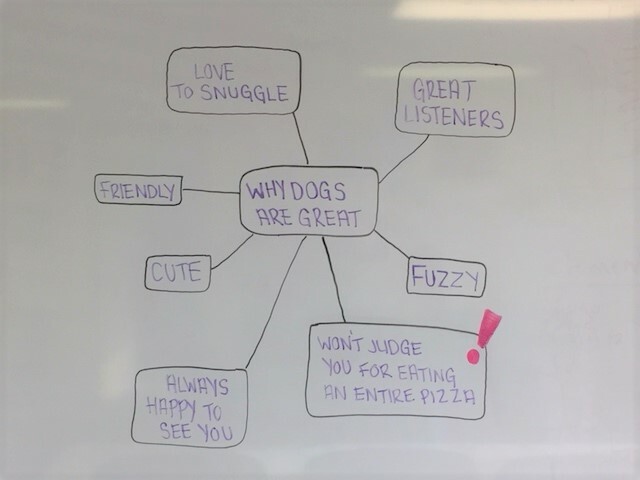 Gone are the days of mapping out my essay on why dogs are great (a real page turner in my humble opinion) – now, mind maps can help me plan out a website launch. Laying out your ideas in a visual way will not only help you to better organize your thoughts, but also make it easier for others to understand. So don’t be afraid to doodle away – it’s more useful than you realize. 3. When journey mapping, look for overlap. During Top Draw’s workshop on journey mapping, my favourite takeaway was to look for overlap. Oftentimes, if we keep seeing the same thing, our initial reaction is to think that we’re doing something wrong or missing some new, important idea. But the fact that there is overlap IS the important idea. When looking at your customer’s journey through the marketing funnel, if there are recurring thoughts, feelings or actions – those are exactly what you want to be focusing on. Needless to say, I definitely enjoyed myself and would encourage everyone who is even slightly interested in UX to check out this event! Have you recently visited a conference that impressed you? Share your own “A-HA!” moments in the comments below!